A sauce made with tomatoes, pepperoni and extra virgin olive oil (3%). 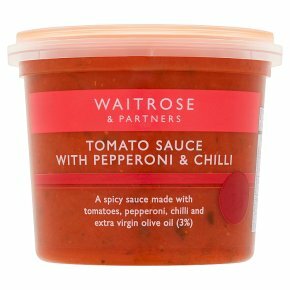 INGREDIENTS: tomato (58%), pepperoni (9%) (pork, salt, pork fat, corn dextrose, chilli powder, antioxidants (rosemary extract, sodium ascorbate, citric acid), spice extracts, garlic powder, paprika, smoke flavouring, preservative (sodium nitrite)), tomato juice, water, onion, extra virgin olive oil (3%), Parmigiano Reggiano cheese (milk), garlic purée, wine vinegar, grape must concentrate, rapeseed oil, sugar, basil, grape must, salt, oregano, dried red chillies, black pepper. Time: 3 - 4 mins. CHILLED. MEDIUM HEAT. Empty contents into a pan. Heat gently, stirring occasionally, until piping hot. Stir before serving. Do not reheat once cooled.